Hotel on White Sand Beach. 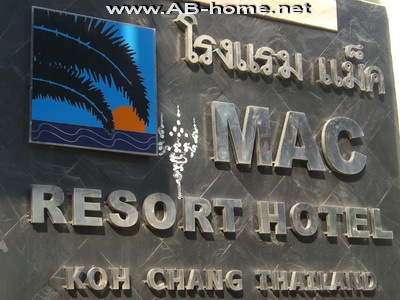 Mac Resort Hotel is on White Sand Beach in Koh Chang island in Thailand. This good 3 star hotel has comfortable and nice rooms next to the ocean and the white beach of White Sands. Mac Koh Chang has also a good restaurant with breakfast and selected Thai and Farang food. Mac Hotel is direct in the center of White Sand and offer central accommodation which is perfect if you like to going out for dinner or nightlife. The beach front rooms of Mac Resort are a quiet option if you like to relax and read a book in your holidays or honeymoon. From the bathtub of Mac Resort Koh Chang you can watch the sunset and the warm water of the sea. For beach vacation and luxury traveling is the Mac Hotel Koh Chang one of the best accommodations on Ko Chang in the Gulf. For bookings and online reservations of many Koh Chang Hotels click here.